Super delicious, super healthy and bursting with fresh, south-of-the-border flavor, this entree chopped salad is sure to please! Do you ever feel like parts of your life are overdue for a bit of… ah, let’s call it… rejuvenation? I’m definitely there, and lately, it’s been in more areas than just one. This Chopped Mexican Quinoa Salad with Chili Lime Shrimp helped with my resolution of this problem. Read on to see what I mean. You might identify. It all started with a little trip Scott and I had planned. It was a special family get together in another part of the country. I have lots of brothers and sisters and sadly, we’re spread out all over the country and don’t get to see each other nearly often enough. So when there’s an “occasion”, whether it’s a wedding or a milestone birthday, we all try our best to make it work. When I started packing for the trip, I realized that my summer wardrobe could definitely use a bit of that “rejuvenation”, but my week was busy and I didn’t really have time to shop. My sweet husband, however, took care of that for me. He went out one day to run a few errands and came back with, not one, not two, but FIVE of the prettiest dresses you’ve ever seen. I loved them all and couldn’t believe he found them in one shopping “hunt” (as he calls it). I ran upstairs to try them on and give him a little “fashion show”. That’s when the wake-up call came; most of the pretty dresses didn’t look real pretty on me. I had put on a little winter weight and, let’s just say, it was showing in all the wrong places! I did settle on one of the dresses that seemed to camouflage my problem, but the situation made me determined to do a little… yup, you guessed it! Rejuvenation. The trip was delightful, but since we’ve been home, we’ve established some new guidelines (Scott agreed, he was in the same boat with his clothes feeling a little snug too). Getting out early every morning on our bikes and going a bit further each day (up to 12 miles now!) is part of our plan. We’re also drinking more water and consciously eating lighter and leaner with lots of protein and fresh produce. Grilling is a delicious and easy way to prepare healthy meals in the summer, and we’re taking full advantage of the season. We haven’t given up all sweet treats, as that usually makes us want them more, but we’re practicing portion control (small portions!). One of my favorite ways to keep our diet healthy is to make a big pot of quinoa and use it for salads and sides all week long. This Chopped Mexican Quinoa Salad with Chili Lime Shrimp is not only a fabulous way to let this healthy “super grain” shine, but it’s also a great way to incorporate lots of fresh veggies into a delicious, mostly make-ahead meal. Zucchini, bell pepper, white onion, and scallions are finely diced (or sliced) and left raw for maximum nutrition and fiber. Fresh corn is cooked lightly to perfection utilizing an easy microwave technique. And a generous portion of fresh oregano is a delicious finishing touch, complementing all wonderful veggies. And the shrimp? The crowning glory marinated briefly with a few south-of-the-border ingredients; fresh lime juice, honey, oil, garlic powder, chili powder, cumin, and coriander. Just a couple minutes on the grill and they’re ready to top your lovely salad. A fresh, spicy dressing ties it all together with flavors mirroring the marinade. The salad, dressing, and marinade can all be made a day ahead, making this a perfect dish for a summer party. Just prepare the shrimp shortly before serving time and you’re good to go! And if you’re looking for a perfect side for a picnic or potluck, skip the shrimp and serve the salad in a big pretty bowl. I guarantee, it will come back empty! You know those four dresses that didn’t fit so well? Two went back, but the other two are hanging in my closet just. Scott calls them my “inspiration” dresses. I plan to have them fit quite nicely as a result of my “rejuvenation” regime! Do you need a bit of rejuvenation diet-wise? This yummy salad is the perfect place to start. And if you’re one of those lucky souls who doesn’t, I think you’ll fall in love with the bright, fresh, delicious flavors that shine in this salad. The fact that it’s light, lean and super healthy will just be a bonus for you, you skinny thing! P.S. There are LOTS of diced veggies in this salad. Notice how they’re all quite perfect and uniform in size? You might be thinking that I’m very skilled and precise with my knives. Truth be told, I’m actually a bit lazy in the kitchen, so I have a secret weapon to make quick work of dicing zucchini, peppers, onions, carrots, eggplant, cabbage, celery, apples, pears – just about any vegetable and lots of fruits. It’s this little chopper, and I use it all the time for soups, salads and even desserts. 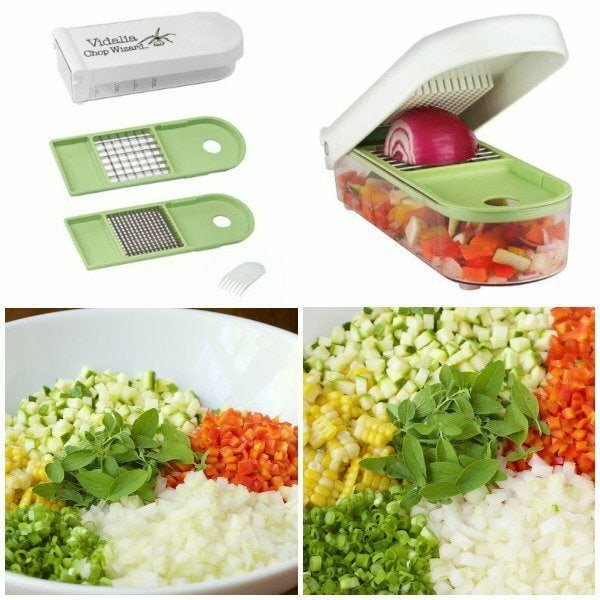 It comes with two different sized dicing inserts for perfect and quick dicing and chopping. I also love that the catch container doubles as a measuring cup, so you can see exactly how much you’ve diced or chopped. I just throw it in the dishwasher when I’m done and it’s ready for my next cooking adventure! Super delicious, super healthy and bursting with fresh, south of the border flavor, this entree salad is sure to please! Skip the shrimp and you have a perfect side for parties, picnics and potlucks! Prepare corn by placing the three ears in the microwave, unhusked. Cook on high power for 12 minutes. Remove from microwave with a clean kitchen towel or oven mitt to a cutting board. Holding the corn with the towel or oven mitt, cut off 2 inches at the bottom of each ear. Hold corn at the silk end and push the corn out of the husk. The corn comes out perfectly cooked and free of silk! Here's a video demonstration of the technique. About 30 minutes before grilling, combine all marinade ingredients in a zippered bag. Gently squeeze bag and tilt back and forth to combine ingredients. Add shrimp and refrigerate for 30 minutes. Remove from refrigerator and drain well, discarding marinade. Prepare a medium-high (about 450˚F) gas or charcoal grill fire. Clean and oil grill surfaces. Sprinkle shrimp lightly with salt and pepper. Grill the shrimp on the first side for about 3 minutes, or until they begin to curl up, turn pink and look charred here and there on the surface facing the grill. Flip shrimp to other side and grill for another 2-3 minutes or until done. Don't overcook or shrimp will be tough and dry. For the salad, combine all salad ingredients in a large bowl and stir gently to combine. Drizzle lightly with dressing and stir again. Top with shrimp. Pass extra dressing at the table. *There are LOTS of diced veggies in this salad. Notice how they're all quite perfect and uniform in size? You might be thinking that I'm very skilled and precise with my knives. Truth be told, I'm actually a bit lazy in the kitchen so I have a secret weapon to make quick work of dicing zucchini, peppers, onions, carrots, eggplant, cabbage, celery, apples, pears - just about any vegetable and lots of fruits. It's this Vidalia Chop Wizard and I use it all the time for soups, salads and desserts. It comes with two different sized dicing inserts for perfect and quick dicing and chopping. I also love that the catch container doubles as a measuring cup so you can see exactly how much you've diced or chopped. I just throw it in the dishwasher when I'm done and it's ready for my next cooking extravaganza. Hi Beth, yes you could definitely make this ahead. I re-warms nicely in the microwave on a medium-low power so you don’t overcook the shrimp. This is a fantastic salad. I threw in a chicken breast for my non-shrimp eating daughter. Well balanced flavours, crunchy, fresh, salty… perfect. I would be nice to include serving size. Thanks! I know I already posted but where did you get that beautiful scalloped platter? I love it! I’ve never had quinoa and happened to find this recipe on pinterest which sounded delicious right away. You inspired me to try quinoa and I cooked it using the method in your instructions, and it came out so wonderful! My boyfriend and I have been eating this every week. This recipe has really opened up my world to healthier eating and cooking! I just found your recipe for Spicy Cilantro Buttermilk dressing and I am going to try that next. So excited! Jessica! Way to go! Sounds like you’re right up our alley! Have fun discovering The Café – we’re over 800 recipes deep, so there’s lots to explore! I have guests flying in today from Seattle, and needed one more dinner idea for this week. I knew if I popped over to your blog, I would find something delicious. Just added this to the menu. I used this recipe & your quinoa recipe for my fourth of July picnic yesterday! It was a hit. I was so inspired, I put it up on my blog, too! Fourth of July Picnic: Chopped Mexican Quinoa Salad with Chili Lime Shrimp. Will be following your blog for more future recipe ideas. Loved this salad, so fresh and healthy. It holds very well to have as a leftover for lunch the next day. I made two tweaks, grilled the corn on the cob because we like the little char marks for added interest in the salad. I did ot have zucchini but had snow peas, so cut them up and added. Very yummy! Hi Chris, I am confused by the directions for the corn in your recipe. The first instruction says 1. Cut corn from ears, set aside. Not sure if I am missing something here or just reading it wrong. Anyway, thanks for all your great creations and the wonderful photos. i love,love, love this salad. It’s healthy, colorful and full of flavor! Chris, a truly delightful, healthy and colorful salad with tons of flavor from all those wonderful ingredients! Your husband Scott sounds like such a wonderful person – what a fabulous idea to go on a shopping spree for you! I need a husband like yours! This salad is the perfect rejuvenation salad. I think summer has us all feeling we hibernated to much over the winter. I still feel like I’m a polar bear, but I know inside I’m a swan! Hi Chris, you husband sounds like a true gem. Yes, I think this winter has been a little hard on myself as well. Noticed the change right away 2 months ago trying to put on a pair of shorts, been working on it since. I used to be able to eat anything, this is just not fair. Oh well! Love this salad, never would have thought to use quinoa in a Mexican style salad, looks delicious!!! I could happily eat this salad every night! Love the bright and bold colors and flavors! We had some quinoa salad yesterday too, but nothing as fancy and gorgeous as yours, Chris. This looks so good! Love your beautiful serving platters too. You have a great husband 🙂 Love, love this salad, from all the chopped veggies, to the quinoa, to that delicious looking shrimp! I would love this quinoa salad of yours! Chris, this salad looks so delicious…all that color and goodness…my husband is going to love it. He is the quinoa fan in the family. And I just ordered the Chop Wizard! This is lovely and I bet you looked wonderful in the dress! I could eat a dish like this and be so happy especially since it is healthy too. Great job Scott and Chris! I can’t believe he did that..
Well we are all different aren’t we.and what some excel in..others don’t and vice versa.. I gave up on buying Jacques clothes.. 39 years ago..:) We have been married 41.. He has better taste for himself and more clothes than I do..
Ha Ha Monique, you’re so right, we really all are so different, and yet the same in some ways! I just automatically “pin” every recipe you post. I have always had delicious results. Just wondered if you have heard of freekah. It is an ancient grain like quinoa. Can’t wait to see what you can come up with for that! Thanks for your sweet comment Toni. I have heard of Freekah but haven’t used it. Now you’ve inspired me!